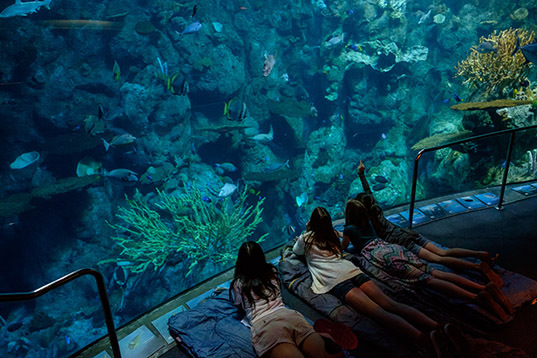 The Aquarium’s overnight programs offer a very unique and exciting way to view and explore ocean life. Through our overnight sleepovers, students participate in hands-on activities, games, crafts, and observe marine animals with our education staff guiding the evening events. Cost $70 per person. One free chaperone per 10 students. Group Size 20 person minimum/ 59 person maximum. Groups of 60 or more require a different booking procedure. Included Dinner, light snack, cereal breakfast, and a souvenir t-shirt. Choose from our three different focuses for your overnight experience. Discover some extraordinary inhabitants of the deep, dark, depths of the ocean and study their highly developed senses, amazing adaptations, and fascinating ways of creating light. Students will experience bioluminescence and biofluorescence; discuss the advantages of living and hunting in the absence of light; and examine biofacts. Sink your teeth into our nocturnal adventure as we explore the ocean to study predators and their remarkable adaptations and methods for hunting. Students will dissect squid OR meet five predators in a game of Ocean Liars Club and discover the many ways animals hunt, eat, and find their food. Explore our thriving southern California waters as we take a close look at plankton, our tiniest residents, to the largest animals on the planet, the blue whale. Students will learn about our unique marine food web while completing a squid dissection, examining plankton from Rainbow Harbor, and touching live animals. Visit our FAQ for answers to some of your most common overnight questions.